Imagine sitting down to enjoy a nice drink and whilst taking a sip you look down you are faced with a small frog in your mug. A nice surprise or maybe not! This was the idea behind the Frog Mug which were first produced around 1750 but became very popular during the first quarter of the 19th Century. 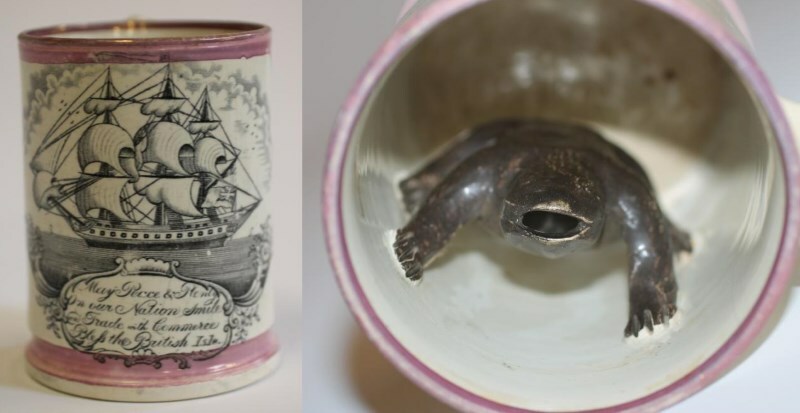 19th Century Sunderland Frog mug commemorating the Crimea, the reverse depicting the ship The Star of Tasmania. Sold for* £90 at David Duggleby Auctioneers, Feb 2018. One theory of how the frog mug came to be made was that a potter who had nearly completed some mugs, had left them to cool overnight. On his return he found a frog sitting at the bottom of one of them. He was so surprised and amused he decided to make a mug with a frog inside based on the idea. They proved so popular the frog mug was created. A Victorian Sunderland Lustre Pottery Frog Mug, printed in underglaze black with a three masted sailing ship over a verse “May Peace & Plenty … Bless the British Isle” (sic), within pink splash borders, 4 3/4″ high . Sold for £170 at Hartleys Auctioneers, Nov 2017. Most frog mugs feature a frog on the side or on the bottom, and occasionally on the rim. Some frogs have open mouth so when the drink was poured it would also go through the frog’s mouth. There are some examples of larger vessels having multiple frogs and even lizards as well. 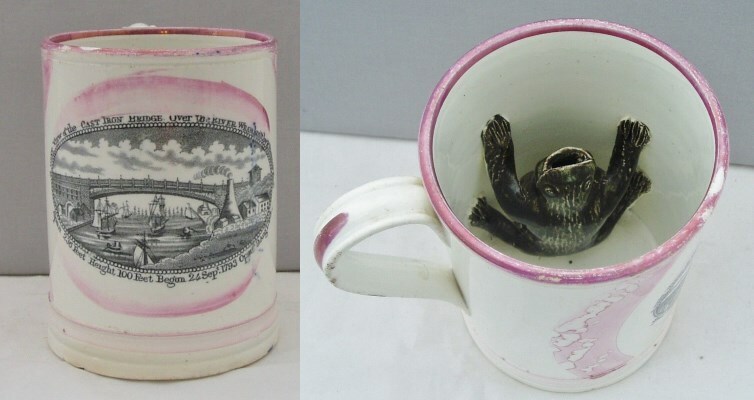 A fine antique Staffordshire twin handled Frog Mug mug relief moulded with a dog catching a bird. Sold on ebay for £300 in May 2018. The earliest frog mugs date to around 1750 and are largely associated with the Sunderland potteries including Brunton & Company (afterwards Moore & C0) who were noted with early examples. One of the most noted potteries for the production of the frog mug was Dixon and Co. Although Sunderland and the north-east were the leading area for the frog mugs, they were also made in the Stafford potteries and the Leeds potteries. The frog mugs created in Sunderland pimarily feature the famous Sunderland lustreware with its pink lustre decorated with black transfer prints often with mottos, phrases and sayings. More popular designs include portrayals of the Wearmouth bridge, Ironbridge and the Crimea. As many of these mugs were used by sailors many had a strong nautical theme and featured sailing ships, the Sailor’s Farewell and the Sailor’s Return. Coloured printed pearlware frog mug of ‘North East’ interest, with “THE MARINER’S COMPASS”, black bands to rim and foot. Sold for £100 at Anderson and Garland, in September 2017. 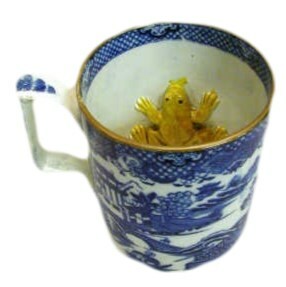 The majority of antique frog mugs made in Sunderland can be bought from around £60 to £200. The main factors affecting price are rarer transfers & motifs and condition. The price of other examples is variable, with great variations in price – from £40 to £1,000. Example pieces and prices have been given in this feature. The frog mug is a quirky, attractive item with great historic interest, and collections can still be created for a modest investment. A rare Swansea Cambrian Pottery blue transfer printed Frog Mug, the interior with moulded yellow frog. Circa 1790. Sold for £700 at Peter Francis Auctioneers, December 2003.